THE PRIDE of Walthamstow is making friends in very high places while the nation celebrates its Olympic success over the summer in Rio. 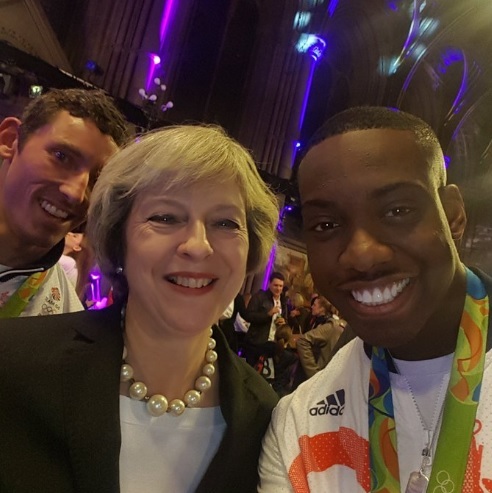 Taekwondo star and Olympic silver medallist, Lutalo Muhammad, grabbed a chance selfie with the Prime Minister, Theresa May, in Manchester yesterday (October 17). Unfortunately for Lutalo, he was photo-bombed by another Olympian, David Florence, who got his silver medal in the canoe slalom. Lutalo was part of the four hundred-strong parade of Olympic athletes going through Manchester, with more than 150,000 people lining the streets to see them.